August’s interim results had already shown Q2 improving on Q1, and I was pleased to see Q3 recording further progress. Underlying revenue gained 15% on last year to €19.3m, with operating margins rising from 17% to 18%. 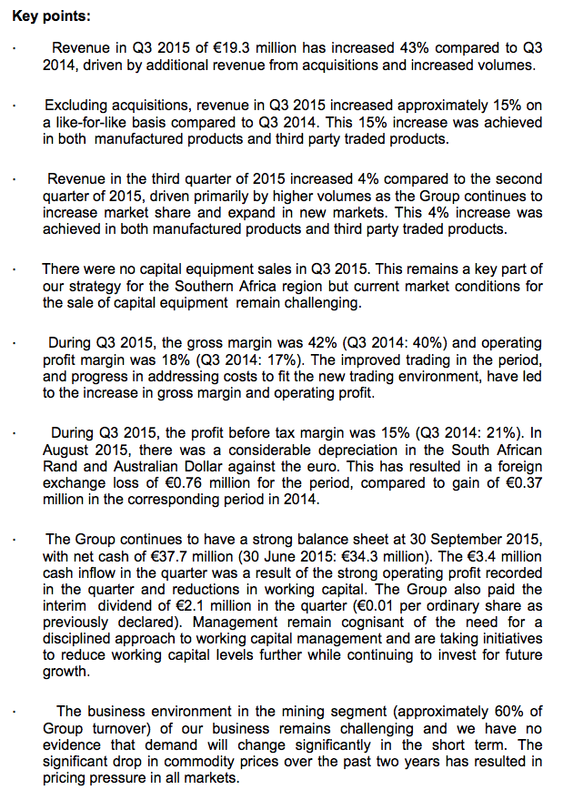 I therefore calculate Q3 operating profit — aided possibly by recent acquisitions — gained 51% on 2014 to €3.5m. MCON confirmed its greater revenue had been driven “primarily by higher volumes as the Group continues to increase market share and expand in new markets”. Meanwhile, the profit improvement was achieved in part by “addressing costs to fit the new trading environment”. All told, it was a very encouraging performance — especially as 60% of group revenue was earned from manufacturing drills and bits for the battered mining sector. The cost of such foreign-exchange movements are accounted for within the financing section of MCON’s income statement, which explains why the Q3 pre-tax margin fell from 21% to 15% on the year. Anyway, I have to say operating margins at 18% look superb for a business where a substantial part of trading “remains challenging” and has resulted in “pricing pressure in all markets”. I had previously cited MCON’s wayward cash generation as one of the drawbacks to its business. However, it appears the managers have now started to reverse what had been a poor trend. Adjusting for the dividend, some €5.5m of cash was produced during Q3 — versus my earnings guess of €2.7m. Most of the difference ought to be a favourable working-capital movement, which will help offset the quite unfavourable movement witnessed during the first half. * Is the acquisition strategy starting to bear fruit? The cash production meant MCON’s bank balance now stands at €37.7m, or roughly 13p per share. As far as I can tell, this cash pile all remains earmarked for acquisitions and MCON says it is “continuing discussions with a number of potential acquisition partners with a view to extending the Group’s product range and adding new customers and new geographic markets”. During the 18 months to June 2015, the group spent €10m on purchasing smaller subsidiaries and I wrote back in August that there were “still no obvious signs that the corporate activity has enhanced returns for shareholders”. However, after this encouraging statement, I now wonder whether the financial benefits of the acquisition strategy are beginning to peep through. Assuming Q4 can replicate Q3, I calculate underlying operating profit for 2015 could come in at €11.8m, which converts to £8.3m at £1:€1.41. Taxed at the 21% applied during the first half, current-year earnings could then be £6.6m or roughly 3.1p per share. Subtracting the €37.7m (£26.7m) net cash position from the £116m market cap, my estimate of MCON’s enterprise value is £89m or 42p per share. Then dividing that 42p per share by my 3.1p per share EPS guess gives a multiple of around 13-14 at the present 55p offer price. Alternatively, assuming the Q3 performance can be sustained for the next twelve months, then my earnings guess comes to 3.7p per share and the underlying P/E would be around 11-12. Were further profit improvements to actually occur, that latter rating would not look too excessive. * Next update — final results in March 2016.